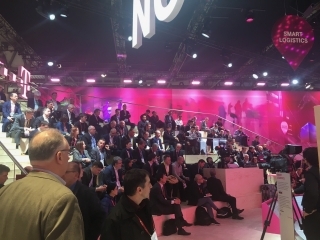 5G dominated this year’s event, where major operators and vendors vied for position as the fastest, most prepared and technically advanced. A variety of 4G technology was also on display, from Gigabit LTE to MIMO antennas, and this is where most of the immediate investment is going. Virtual Reality demos and games were again popular attractions. We delved behind the hype to assess and digest what's really going on. 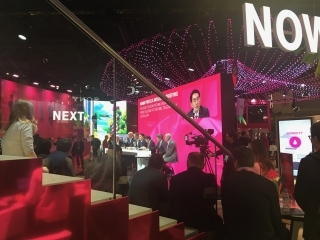 An NGMN panel with senior representatives from across the globe outlined the potential. Verizon Wireless intends to make a substantial investment in (1) as an alternative to laying fibre or coax cables to homes, competing with Cable TV and fixed broadband providers. They’ve run some successful trials with Samsung in places like Sacramento, achieving as much as 600 metre range from their cellsites. The industry expected more in the region of 200m. Samsung demo’ed their live 5G mmWave kit to me which included an iPad sized tablet with 5G mmWave built in talking to a 1024 element antenna. It uses beam steering rather than Massive MIMO to achieve these high speeds. While coverage is better than expected, there are inevitably going to be gaps which would need additional small cells. Others have tried (and failed) with FWA before and I wonder what is so different about it this time. Not all US cities are the same as the trial sites which have less existing broadband competition, virtually no foliage, hilly terrain or other challenges. AT&T is also trialling this approach but I haven’t heard anyone elsewhere in the world seriously considering it at the moment. While the US “benefits” from high charges for broadband internet, the rest of the world would need a very low cost to make the business case work. The longer term intention is that this system would also form the platform for option 3 above. Cutting through the hype, it seems that US and some Asian operators will invest option (2) and deploy some 5G in existing bands. Chris Pearson of 5G Americas recapped the aggressive plans for all four US operators which include T-Mobile’s nationwide rollout at 600MHz. It just won’t go significantly faster than 4G which itself can now reach 1Gbps speeds using carrier aggregation. Capacity gains over the latest 4G aren’t going to be dramatic (I’ve heard estimates as low as 20%). The cynic in me suspects that the prime intent is to be able to turn the 5G indicator light on your phone, even if most of the data service ends up being sent over 4G. Others on the NGMN panel above including even from Japan said that most of their investment would continue to be in 4G. Watch for the marketing hype and abuse of the 5G moniker. Truly high speeds on 5G would require massive spectrum bandwidth. The millimetre wave bands at around 30GHz can allocate up to 400MHz per channel, achieving Gigabit rates. But Radio Planning tool vendors tell me that this causes significant difficulties and variability in a truly mobile environment – just turn around and the signal gets absorbed by your body. European operators including DT and Vodafone appear to have no immediate plans to invest in mmWave 5G and I don’t think that’s much different from other players. We’ll see some islands of coverage at prime locations, stadiums etc., in some regions of the world, but I doubt it will ever be universal even in metro areas. Antenna vendors seemed to be having a field day this year, with MIMO being used to increase the capacity and range of existing cellsites. 4x4 MIMO is a minimum in the US for outdoor sites and becoming popular elsewhere. With space at a premium at cellsites, combined 2G/3G/4G/5G antennas solve a problem. RFS are one of several vendors innovating with single units combining both passive and active antenna – their’s physically overlays the active and passive elements to reduce size. But these monsters still weigh over 70kg and 2m height. Orange France announced a program to upgrade 30% of their national footprint with this type of antenna from Nokia/Kathrein. The major vendors (Huawei, Nokia, Ericsson) are all shipping macrocell basestation hardware that should support 5GNR (New Radio) as a software upgrade. This combination of active Massive MIMO and 5GNR is expected to extend the life and value of existing sites. Mike Irizarry, CTO of US Cellular, highlighted the “huge” cost savings and higher speeds they expect to get using 5G. So where does this leave Small Cell vendors? It’s been really tough for new startups to persuade operators to certify and integrate RAN products into their networks. In-building has fared better with approvals than outdoor, with the likes of SpiderCloud, ip.access still well positioned. Both showed me outdoor variants of their small cells at the show. Commscope/Airvana are making progress gaining approval for their OneCell system with one European Tier 1 operator deploying commercially – they say that being 4G only is no longer as much of a limitation. Sprint will deploy VoLTE in September, the last of the big four US operators to do so. Apart from Enterprise in-building, I’m seeing small cell vendors business strategy being refocused on niche markets – opportunities too small or uninteresting for the big vendors to bother with, but profitable in their own right if done well. ip.access have a mature 2G, 3G and 4G capability which can be adapted to many applications, and in the past have been customised by partner SI’s. 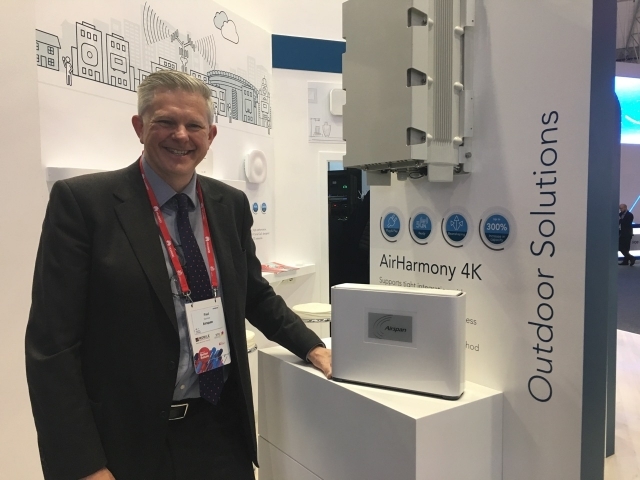 Nick Johnson explained to me how they will focus on four key areas: Private Networks, Cyber, Rural/Satellite (using their new 5W outdoor box) and mobile operators. They had a range of announcements covering these different business areas, from a reseller agreement with Westell in the US to a significant deal with Telenet of Belgium for 3G small cells. Parallel Wireless continues to make great strides, adding 2G to their portfolio this year (so now have 2G/3G/4G capability). One of their niche markets is the Emergency Service Network for the UK/FirstNet for the US, where LTE is being adopted to replace older technology. I hear tests in the UK are going very well, despite a number of fairly complex and challenging requirements. Unlike the hugely expensive US FirstNet system, UK first responders will be able to use their system for voice calls. I’ll leave the bad jokes about dumb cops to others… PW are also moving forward with wide area rural coverage for developing countries, where very low price point and simple installation are key. They’ve recently been selected by Telefonica after successfully completing trials in LATAM. CBRS is inevitably a new opportunity for small cell vendors, although limited to the US market only at this stage. Oren Binder of the CBRS Alliance is hopeful that the FCC will “press the button” and authorise 2-3 SAS vendors by the middle of this year. In that timeframe, the test and certification schemes should be up and running, meaning that commercial products can be switched on immediately. Mark Gibson of Commscope (one of the 3 SAS providers likely to be approved) agrees and points out that the process to revise rules for priority access should be defined in the next couple of months. I could envisage that the FCC might initially limit service to central regions, away from the coast where the naval radar sits before gaining confidence for national rollout. The pace of Environmental Sensors (ESC) rollout is being held back until the rules are finalised but are ready to deploy. Ruckus Wireless tell me they plan to offer a complete managed service, shipping a box that connects to their cloud solution which will host configuration, core network, operations and roaming functions at scale. Initial services are likely to be private LTE networks running Industrial IoT applications rather than being smartphone based. Anything from linking to fork-lift trucks in a warehouse to parking meters for a local council. All four US major operators have joined the Alliance and will want to use the spectrum themselves (initially mainly outdoor, with Carrier Aggregation). Other small cell vendors with CBRS products on show (there were many) include Accelleran with both indoor and outdoor units. Their live demo included live re-provisioning of the Layer 3 software module which could either run on their box or a server. Chinese vendor Baicells hopes to succeed where Huawei and ZTE have been unable to penetrate the US market. SpiderCloud are one of several who have completed interoperability testing. 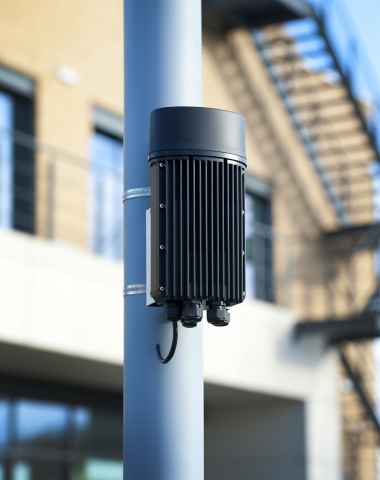 To give some idea of the number of vendors involved, Commscope have tested with about 10 small cell vendors while Federated Wireless have around 40 in their portfolio. 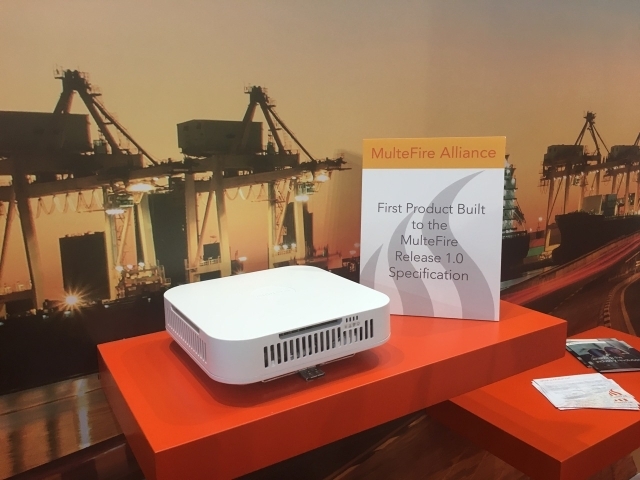 The specifications have been around for a while, so it was with big fanfare that Nokia announced the first MulteFire small cell pictured below – very similar in format and capability to their regular Flexizone box. I could barely tell the difference. Performance will inevitably be better than Wi-Fi because of the inherent features built into LTE, but I wasn’t given specific figures. At this time there aren’t any handsets or even dongles to connect to it, but those are likely to appear within the next 12 months. Nokia will sell this through their Enterprise sales channel and can bundle with suitably scaled down EPC, HSS and management system. I don’t think this is quite ready to be sold through Amazon or Best Buy yet, and others may achieve an attractive price point, but it does show what’s technically possible. Interest is global, especially outside the US where CBRS isn’t an option. Applications are again initially for Industrial IoT, said to be for purposes where Wi-Fi doesn’t quite provide the mobility or system resilience required. Paul Senior of Airspan was in bullish mood, claiming that Airspan are shipping around 2,000 of their “Magic Boxes” to Sprint daily. These are full LTE relays, receiving a high quality signal from a nearby basestation (typically at 1.9GHz) and rebroadcasting locally in the 2.6GHz band. It’s quite a big box - it contains 8 receive and 4 transmit MIMO (hence gets at least 20dB gain more than a typical smartphone) as well as a powerful 5W RF radio. I confirmed the large physical size of the box helps to ensure it is “touch safe”. Just plug in and go. Benefits include dramatically increasing the capacity of the existing macrocells, because the high quality RF back-channel means it can spend more of its resource sending data bits rather than error protection bits and use much higher modulation rates. What’s new is that Airspan have bought their own spectrum. Paul indicated some frustration with operators not allocating dedicated spectrum to small cells and thought he’d just go and do it himself. Using the brand DenseAir, they have bought some 3.5GHz in Ireland, have acquired some 2.6 TDD in Belgium and are actively involved in the upcoming UK auctions. The twist is that the Magic Box is capable of receiving signals from multiple external network operators simultaneously, rebroadcasting on the same band. This could provide an instant neutral host presence by simply plugging in the box. He’s got to convince operators that this won’t compete with them but Airspan have no intention of retailing the service and simply want to sell more equipment. The solution will be good for smaller properties, large residences, SOHO businesses and isn’t aimed at the larger buildings that justify DAS or Enterprise Small Cell systems from SpiderCloud, Huawei, Ericsson etc. Zinwave launched UNItivity 5000 which adds higher frequency bands for the 3-6GHz band, now available for trials. Slavko Djukic, CTO, told me he expected most interest in the 3-4GHz range such as for CBRS but it would also work with 5GNR. It’s one of the few DAS systems I’ve seen that addresses these higher frequencies. We agreed that Massive MIMO and even higher order MIMO don’t make sense for in-building use – 2x2 MIMO is about as much as you’d normally need. Zyxel, perhaps better known for their wide range of CPE equipment, expanded their DAS products this year, aimed at the lower/smaller buildings although it can expand to 64 RF heads. With four RF channels, they can trade off the use of MIMO to provide support for more than 2 operators. They added a ‘Slim DAS’ solution this year limited to 2 bands or two operators and four coverage units. Arguably this would compete with some of the repeater products available today. JMA launched XLINK, a digital in-building DAS which is aimed to reduce cost partly by using commodity Intel processors rather than custom hardware. As with other DAS vendors, it appears they’ve incorporated the base-station function as an option. Figuring out what’s going on in your network was never easy. Viavi (who launched their NITRO platform) tell me that some of the optimisation projects they undertake sometimes result in equipment being switched off because it wasn’t planned that well. RF planners RANplan were pleased to have added Verizon to their customer list – they are being used for the more dense urban areas alongside mainstream wide area planning tools. Cardinality have done some clever stuff with “Big Data” using open source tools such as Hadoop and Apache Spark, claiming to digest 26 different data sources and produce useful dashboards which work out customer perception. Innovile, a Turkish company, combine performance management, configuration management and self-optimisation functions that work transparently for all the major RAN vendors equipment. It reduces dependency on vendor specific specialists and dare I say could open the door to add other vendors into a network with much less operational impact. They’ve just signed up a huge Tier 1 Russian network after a challenging competitive vendor selection process. Sensewhere also caught my eye. Inbuilding position finding and location services are tough to achieve where GPS doesn’t reach, with some techniques requiring a rigorous mapping floorplan fixing all Wi-Fi/Small Cell/Bluetooth equipment. This company uses all the various sensors in your smartphone to figure out where you are going, and aggregates that with data using crowdsourcing. If you go up in a lift, the barometer can indicate by how much. Their biggest customer is TenCent of China (who operate the equivalent of Google/Facebook and Paypal combined) and incorporate it in their App. I did ask if this would be good enough for first responder E911 applications but it was thought that might not quite meet requirements yet. The Deutsche Telekom booth included an impressive real-world application for Augmented Reality, showing a wiring technician exactly which cabling to connect within a street-side box. I could see this being highly applicable but I doubt this needs 5G to work effectively. 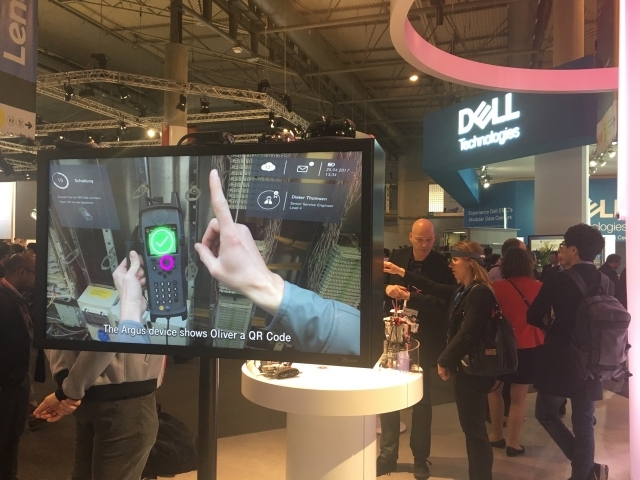 As always, this report digests a huge number of meetings, booth visits, demos and press releases throughout the event. Apologies for all that we weren’t able to include and I hope to expand on a few areas in the coming weeks. The event attracted 107,000 and seemed to be busy throughout. It remains the best place to meet and catchup with technology developments, although the conference program has steered away from controversy in recent years. Analyst John Strand uses the phrase “clinically cleansed” of the regulatory challenges facing the industry. Nonetheless, it is a busy and worthwhile event if you can discern between the hype and the reality. 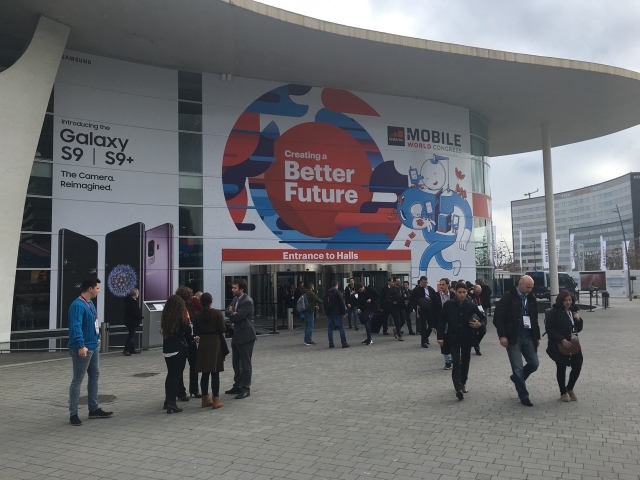 Best report from MWC I have read!